Stunning little lady looking for her forever family. Charting apx 4lbs adult weight. Parents are Ukrainian imports but I have transferred paperwork to ACA so puppy has domestic registration. Please take the time to check out my facebook page CUTE CRITTER KENNEL for lots of customer reviews and facility pictures. We are very familiar with shipping. Items Included: Nose to tail vet check, AKC reunite microchip, utd shots w/records, and puppy pack. 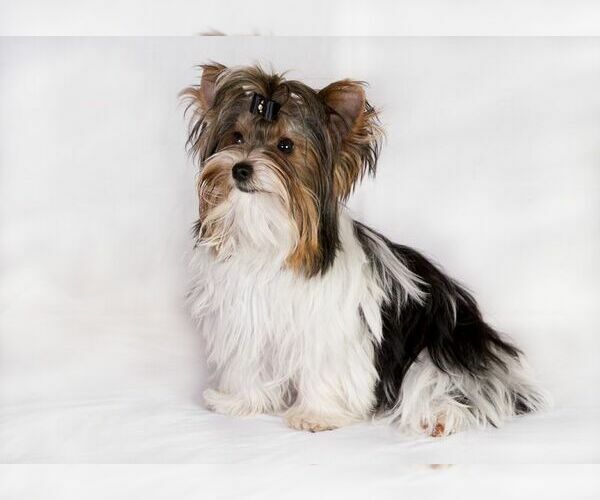 Overview: The Biewer Terrier, originally called the Biewer Yorkshire Terrier a la Pom Pon, was first bred by Mr. and Mrs. Werner Biewer in Germany. 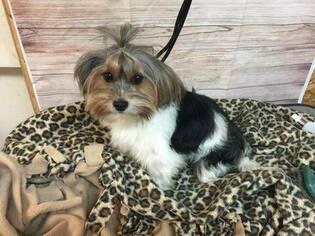 The first Biewer was born in 1984 and it was through a selective breeding program that the Biewer Yorkshire Terrier a la Pom Pon was developed. It was first registered as a breed of its own with the ACH, and the breed standard was signed in 1989. After Mr. Biewer died in 1997, interest in the Biewer breed began to diminish. In 2003, the Biewer Terrier was brought to America and within one year the popularity of this loveable dog began to grow. The Biewer Terrier was accepted as a distinct breed of its own by the American Rare Breed Association in 2007. With its lighthearted, playful, child-like attitude, this tri-colored toy terrier is gaining popularity with dog lovers everywhere. Equally as good with children as it is with other dogs of all sizes, the Biewer Terrier is a loyal and fast friend to all it considers part of its family. Although every dog has its own unique and special personality, as a breed, the Biewer Terrier is confident, happy, fun loving and even tempered. Generally speaking, Biewers are not noisy or especially difficult in any particular way. Temperament: The Biewer has a whimsical, light hearted personality and is very playful. 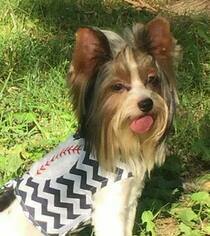 They are unique, confident, happy little dogs who have individual personality traits that make them extra-special. Biewers are good with children, other family pets, and are neither yappy nor frail. Care: As a companion most owners prefer to have this breed in a "perpetual puppy cut." A bath at home about every two to three weeks will maintain a healthy coat if it is combed out with a wire comb once a week. Show Coat: The Biewer Terrier will develop a coat that reaches the ground. Some breeders wrap the coat to produce a very impressive elegant floor-length coat for the show ring. Their coat is very similar to human hair, but it is not suggested to use human shampoo as dogs have a different pH than humans. Using human shampoo can result in dry, itchy, flaking and sometimes allergic reactions in their skin. It is best to always brush the Biewer that has been sprayed with a light mixture of conditioner and water. Never brush a Biewer Terrier when it is completely dry as it may damage the coat. Ears should stand erect as young puppies. To keep them erect they must be trimmed every few weeks. By beginning about 1/3 of the way down from the top of the ear, carefully snip or shave, with a trimmer finisher, the hair from the inner and outer ear surfaces. Training: Terriers are willful little creatures and Biewers are no exception. They can be taught, but they will do it on their own time, and once they realize tricks get them attention, they will be eager to learn more. Training should involve lots and lots of positive reinforcement (they love to the be the star) and treats. Harsh handling of a Biewer can cause them to avoid behaviors all together. Activity: These are active little dogs that need a daily walk. Play will take care of a lot of their exercise needs, however, as with all breeds, it will not fulfill their primal instinct to walk. Dogs that do not get to go on daily walks are more likely to display behavior problems. If your Biewer Terrier zooms around the house like a speeding bullet, it is a sign that he needs to go on more/longer walks where he is made to heel beside or behind the human. Remember, in a dogs mind, the leader leads the way. They will also enjoy a good romp in a safe open area off lead, such as a large, fenced-in yard. Health Issue: They may be prone to collapsing tracheas, hypoglycemia, Legg-Calve-Perthes disease, patellar luxation and portosystemic shunts. Their long coat needs daily brushing, and they should be bathed on a regular basis.